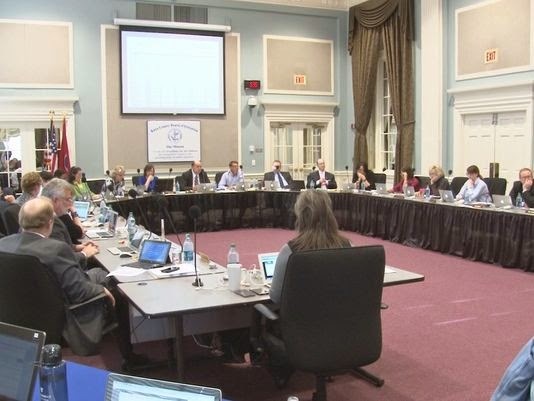 Knox County Schools Superintendent Jim McIntyre unveiled his proposed budget Wednesday evening for the upcoming fiscal year, a roughly $440.8 million no frills spending plan that essentially maintains current services, offers no major initiatives, but does provide for a teacher pay raise. "This FY16 budget is not an ideal proposal by any means, but it is a budget that is reasonable, responsible, and supportive of the terrific educational work happening in our classrooms across our school system," McIntyre said. "Ultimately, I feel strongly that if fully funded, this is a budget that will move us forward in our journey toward our ambitious goal of 'Excellence for Every Child.'" At the heart of the proposal is a 4 percent pay bump for teachers that will cost $10 million. However, the increase assumes that the state will kick in about $4.4 million and that the Knox County Commission will appropriate another $5.6 million above and beyond normal revenue projections. Overall, the spending plan will increase 3.7 percent, or about $16 million, from the current budget of $424.9 million. "Our teachers continue to do an extraordinary job of facilitating student learning and success in an era of great change and enhanced expectations," McIntyre said. "In order to retain our outstanding teachers and recruit the next generation of exemplary educators, we must ensure that we offer a more competitive and professional level of compensation for our teachers." McIntyre's budget eliminates some positions, including five teacher and 12 clerical jobs, which he wants to cut through attrition. He also proposed eliminating four central office and school-wide positions. In addition, the spending plan also cuts Project GRAD monies and the APEX performance pay, and reduces the summer "bridge" program by 50 percent. McIntyre said it would be up to the school board to make the ultimate decision, and cutting APEX would "be a conscious choice" on its part that would occur "more halfway into the school year in which they are being earned, but despite the disadvantages, this is perhaps the most reasonable course of action." Several board members questioned many of the items listed, from APEX funding to the potential job cuts. The proposed budget also assumes continued funding of the almost $2.9 million early literacy program, which is supported by a grant from the county mayor's office. County Mayor Tim Burchett, however, has said he isn't sure he'll continue it because he's said that he doesn't believe that the program has been very successful. The superintendent said if the grant wasn't extended he could cut the program. "With limited budgetary flexibility, the loss of these funds would be devastating to our early literacy efforts," he said. McIntyre also proposed a $15.75 million capital improvement budget for the upcoming fiscal year with almost half – more than $6.7 million – in additions and renovations for Pond Gap Elementary School. It also includes upgrades to Karns High School and upgrades to the parking and drives at two elementary schools. The capital improvement proposal sets aside $2 million for security improvements and $350,000 technology and communication upgrades across the school systems. At Pond Gap, the superintendent proposed renovating and adding some 47,250-square feet to include 12 new classrooms, several suits, a gymnasium, art and music rooms, media center, cafeteria, kitchen and new bus drive. At Karns High School, McIntyre suggested putting $750,000 into replacing lockers, ceiling tile, wall base molding and parking lot lighting. The 2015-16 fiscal year starts July 1.